Filters: Author is Randy G Cutter Jr.
R. G. Cutter Jr., “Demonstration Project: Supervised LFH Texture Feature Classification of Gridded Bathymetric Data from Saint John, U.S. Virgin Island Survey, Western Subarea for Habitat Structure Class Prediction (Saint John West - LFH)”, University of New Hampshire (UNH), Center for Coastal and Ocean Mapping (CCOM)/Joint Hydrographic Center (JHC), 2005. R. G. Cutter Jr., “Benthic Habitat Classification and Characterization Using Multibeam Sonar Data: The Provisional Truth of Ground-truth”, International Conference for Underwater Acoustic Measurements (ICUAM). Heraklion, Crete, Greece, pp. 0-0, 2005. Y. Rzhanov, Huff, L. C., and Cutter Jr., R. G., “Seafloor Video Mapping: Modeling, Algorithms, Apparatus”, International Conference on Image Processing (ICIP). Rochester, NH, USA, pp. 0-4, 2002. Y. Rzhanov, Huff, L. C., Cutter Jr., R. G., and Mayer, L. A., “Sensor-assisted Video Mapping of the Seafloor”, IEEE Oceans. Biloxi, MS, USA, pp. 0-0, 2002. Y. Rzhanov, Huff, L. C., and Cutter Jr., R. G., “Underwater Video Survey: Planning and Data Processing”, International Conference on Signal and Image Processing (SIP). Kauai, HI, USA, pp. 0-4, 2002. 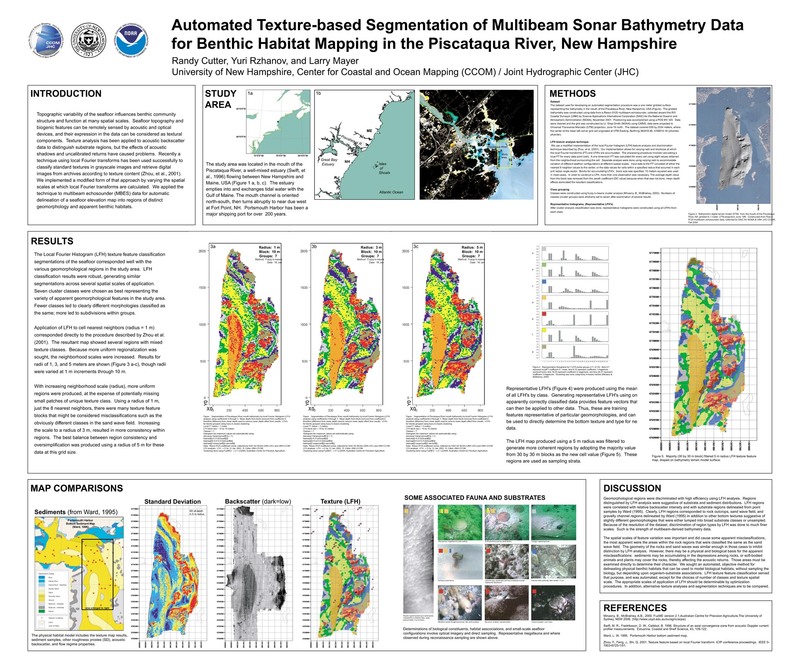 R. G. Cutter Jr., Rzhanov, Y., and Mayer, L. A., “Automated Texture-based Segmentation of Multibeam Sonar Bathymetry Data for Benthic Habitat Mapping in the Piscataqua River, New Hampshire”. 2002. R. G. Cutter Jr., Rzhanov, Y., and Mayer, L. A., “Quantitative Ground-Truthing of Habitat Characteristics Using Video Mosaic Images”. 2002. R. G. Cutter Jr., Mayer, L. A., and Rzhanov, Y., “Seafloor Habitat Mapping: Considering Techniques for Expansion of Spatial Scales”, Workshop on Deep-Seabed Survey Technologies. Bergen, Bergen, Norway, pp. 0-0, 2001. R. G. Cutter Jr., Mayer, L. A., and Rzhanov, Y., “Subtidal Benthic Habitat Mapping Method Development Using Portsmouth Shallow Survey Data”, International Conference on High-Resolution Survey in Shallow Water (HRSSW). Portsmouth, NH, USA, pp. 0-0, 2001. Y. Rzhanov, Huff, L. C., and Cutter Jr., R. G., “Improvement of Image Alignment Using Camera Attitude Information”, International Symposium on Signal Processing and Its Applications (SPIA). Kuala Lumpur, Kuala Lumpur, Malaysia, pp. 0-4, 2001. Y. Rzhanov, Cutter Jr., R. G., and Huff, L. C., “Sensor-Assisted Video Mosaicing for Seafloor Mapping”, International Conference on Image Processing (ICIP). St. Andrews, New Brunswick, Canada, pp. 0-4, 2001.